Once again, I'm so excited to be included in this month's Professional Organizers Blog Carnival! What is the Professional Organizers Blog Carnival? I'm glad you asked! It's a monthly blog post that professional organizers contribute to. Each month is a different theme and includes posts related to that topic from several professional organizers. It's a great place to find advice, ideas, and tips for the theme of the month. This month is all about Office Organizing. Whether you have a home office or a small business office, these tips will help you get organized so you can be more productive! So check out all the tips in this post and find the ones that will help you organize your office! 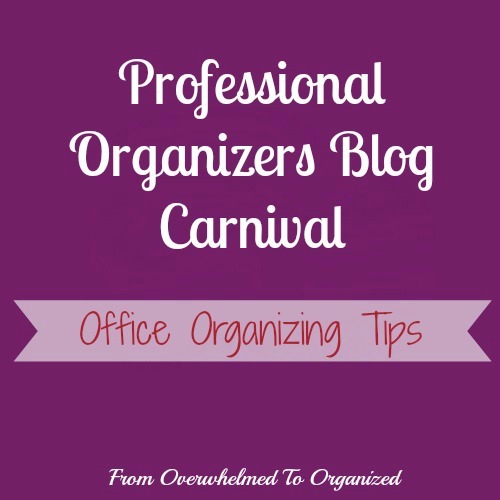 You can check out the Professional Organizers Blog Carnival here. And after reading those tips, if you're looking for basement or attic organizing inspiration, you can also check out my Office Organizing board on Pinterest! Do you have a home office or a business office? How do you organize it? 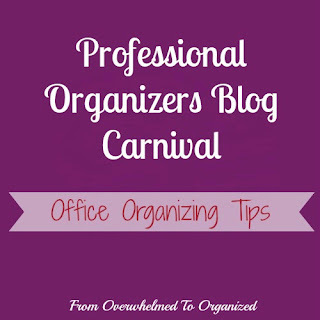 Which of the posts in the Professional Organizers Blog Carnival will help you with your office organizing the most? Hilda, thank you for participating in the Professional Organizers Blog Carnival and sharing the post with your readers. I hope to see you in another one soon! Thanks for hosting the POBC Janet! It's always fun to participate and to see what all the other organizers have shared on the topic.